Don't let the cool name fool you. This is not a very good film. Interview with actress Erika Blanc. In Italian with English subtitles. They are both the same trailer just in different languages and with different title cards. Interview with actress Erika Blanc. Italian with English Subtitles. Interview with production designer Lorenzo Baraldi. Italian with English subtitles. The special features here are good, but not great. The commentary with Troy Howarth is the highlight of the disc. Howarth clearly knows his stuff and approaches the track with an open enthusiasm that stays with him all through the track. 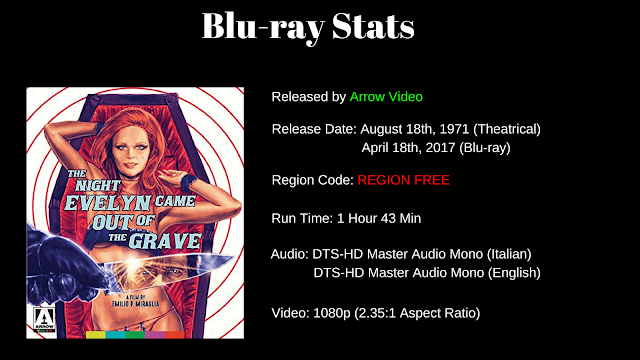 The look back on the film with Stephen Thrower is also nice, but covers some of the same ground as the commentary track. Still, it is worth the watch. The rest of the special features are ok. I could have just done with the commentary and the Thrower interview, but the other stuff is there for bigger fans of the film than I.
I can not comment on the packaging as I was sent this disc for review. I can tell you that the artwork is reversible and features newly commissioned artwork by Giles Vranclx. colors come through beautifully here. There is also a nice layer of grain and detail in the close-ups is good. Blacks are nice and dark and depth is good. We get two tracks: the original Italian audio and the English version. Both tracks are presented in DTS-HD Master Audio Mono. Both tracks are dub jobs which means that both tracks suffer from the same lip-sync and other problems that come with dubbing a film. I will say that despite the dubbing issues (which are inherent to the film) the score by Bruno Nicolai is fantastic and comes through crystal clear. 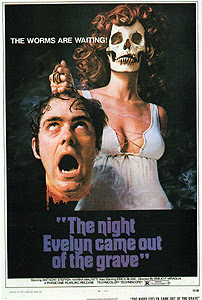 The Night Evelyn Came Out of the Grave is an ok film at best. This is a Giallo through and through, but the filmmakers decided to add gothic elements to the film and they don’t mend very well. I found myself wanting the gothic stuff to go away so that I could focus on the Giallo aspects of the film, but they are caked on this film. There are a lot of people who like this type of stuff, but I found myself bored about half the time. There are some twists and turns that I did not see coming, but the whole “ghost” aspect of the film was kind of dumb. I understand what they were trying to do, but I grew tired of it fast. There are some striking images here and that is a credit to director of photography Gastone Di Giovanni as well as director Emilio Miraglia. The use of the scope format and the composition are beautifully done and should be used to teach up and coming DPs how to frame a shot. The Night That Evelyn Came Out of the Grave may not be that great, but Arrow still gave it its due. The picture quality is fantastic and the sound is good, but laughable (in a good way). The special features are a mixed bag, but that is how it is sometimes. I am glad that I watched the film, but I can tell you that I will not be revisiting the film any time soon.